Let your faith shine with these beautiful, simple, plain polished Christian cross diamond stud earrings crafted in .925 sterling silver. These are real, authentic solitaire white diamonds at the center, with 0.015 carats each (for a total of 0.03 carats). Cross studs measure 12mm x 9mm in size (just under 1/2" x 0.35 inches). Apples of Gold Jewelry is a Christian-owned company who believes that Jesus Christ is the only way to heaven. "Jesus saith unto him, I am the way, the truth, and the life: no man cometh unto the Father, but by me" (John 14:6). 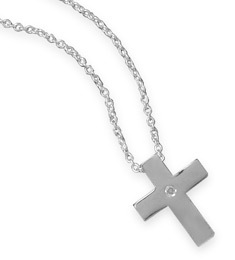 The single, solitaire diamond center represents the One Way that Jesus proclaimed as the way to God the Father. 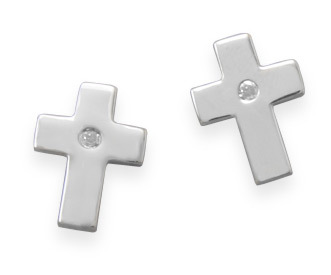 Let your faith shine with these beautiful cross stud earrings! Includes free shipping and our 45-day return policy. 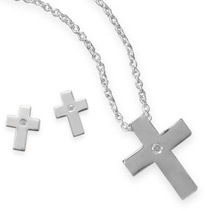 Also available with matching diamond cross necklace or purchase the set together (shown below). We guarantee our Faith Shines Christian Cross Diamond Stud Earrings to be high quality, authentic jewelry, as described above.